Tracks in your door system are like the train tracks for a locomotive. In this case, YOU are the train engine. If you have damaged tracks, you, the train engine, experience difficulty when attempting to move the “train” or door in your case. Settling: Due to age, where the rollers (wheels) live on the right and left side of operating panels there has been a settling or pothole-like effect. Think of what would happen if you left your heavy car on a field for a month in the rain. Where the weight-bearing points were- the four wheels, there would be depressions in the field. In this same way, over MANY years the wheels can “settle” in on the track. Gouging, nicking, or dinging can occur when a wheel breaks within the lower rail or extrusion. You may NOT see the evidence of this right away until the door becomes extremely hard to move. By then it’s common that the broken wheel has also damaged the track. Corrosion!!! Think cancer or leprosy for your door system. Corrosion occurs primarily in doors that are near salt, sand and wind situations, but can also occur near pool areas due to chorine off-gassing conditions. To us it does NOT matter HOW the track damage occurred. If we see evidence of it we need to address it as damaged track ruin wheels! TIP: Keep tracks clear of debris. Regularly clean off salt, sand, pet hair and people dirt. Use a wire brush to scour the track, removing any burrs. Vacuum and then clean the track with a light degreaser, making sure to thoroughly rinse and dry the track areas. We address track damage in a number of ways. Many people have the misconception that you can go to a store and purchase “new track” for their existing sliders. This is NOT true. The original track must stay with the door. Think of your body as an example. If I told you I were going to cover your head with a cap you would NOT expect me to decapitate you. You would however expect me to put a HAT on your head. In that same manner, tracks are capped or covered over with stainless steel solutions designed to act like new runners for the rollers. The type of track and attachment system may be determined by a number of factors including the amount of damage in a particular door system. We have seen some tracks so badly damaged they looked like small roller coaster tracks. Others were so badly corroded that they had silver dollar sized holes corroded not only through the track but right down into the concrete. Believe me, we have seen it all with corrosion! 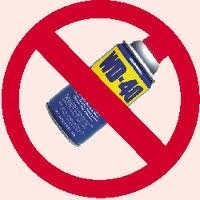 TIP: NEVER, EVER, EVER use WD-40 to lubricate your tracks!